Culture and the world's craziest mountain coaster! 2017 was the year I'd finally make it to Europe. I was already had plans to Oktoberfest; however, direct flights to Munich from Boston weren't a thing unless I was willing to fork over the equivalent of 1 month's rent in downtown Boston. 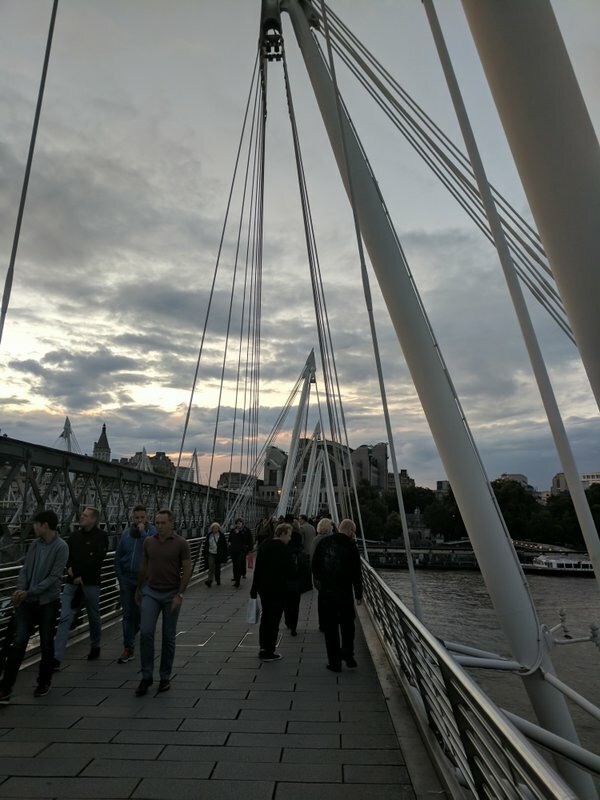 Then I found a roundtrip flight from British Airways to London for $400 and would take solo flights in and out of London, but not before stopping at a few parks! I write the first part of this report as I'm on a train to Blackpool. This was my first time outside the country unless you count La Ronde (I went just for La Ronde, not Montreal) or Niagara Falls which feels American outside of the beaver tails and poutine. 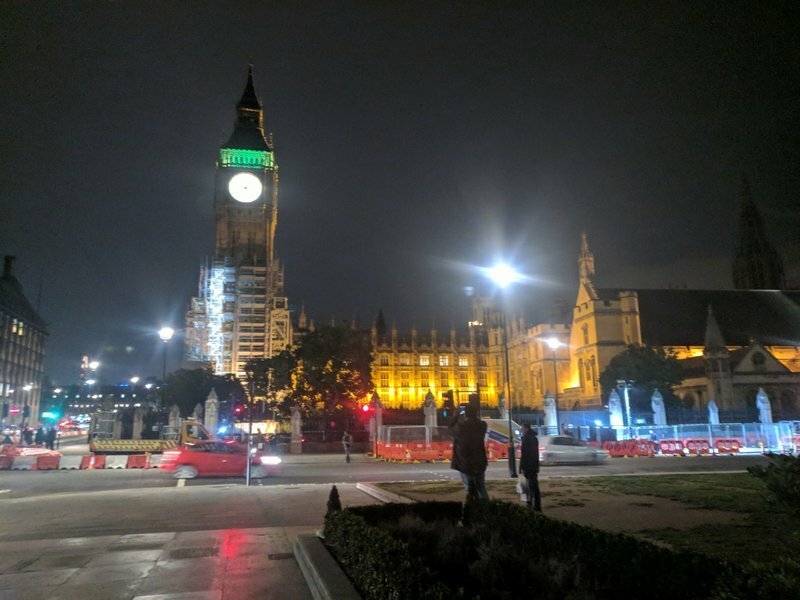 So I was a bit of a kid in the candy store taking pictures of the Eye and Big Ben as the famous sights I've seen on Sherlock were right in front of my eyes along with the screaming drunks and street musicians I see regularly back home. I'm definitely not in Boston anymore. Looks like an interesting place. Though the first thing I noticed when I stepped out of the Tube station wasn't the iconic clock tower or the massive Ferris Wheel. Those were expected. 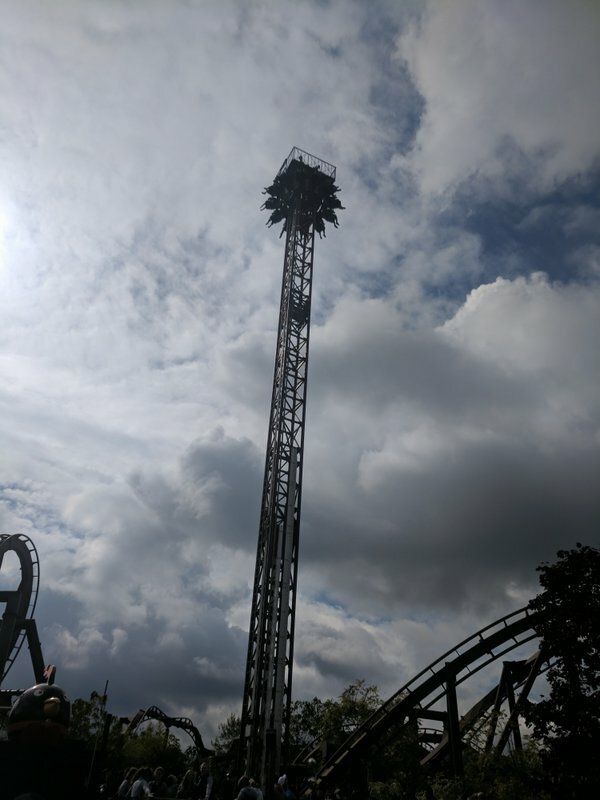 I was shocked to see a Star Flyer operating. And it wasn't a dinky little one either. 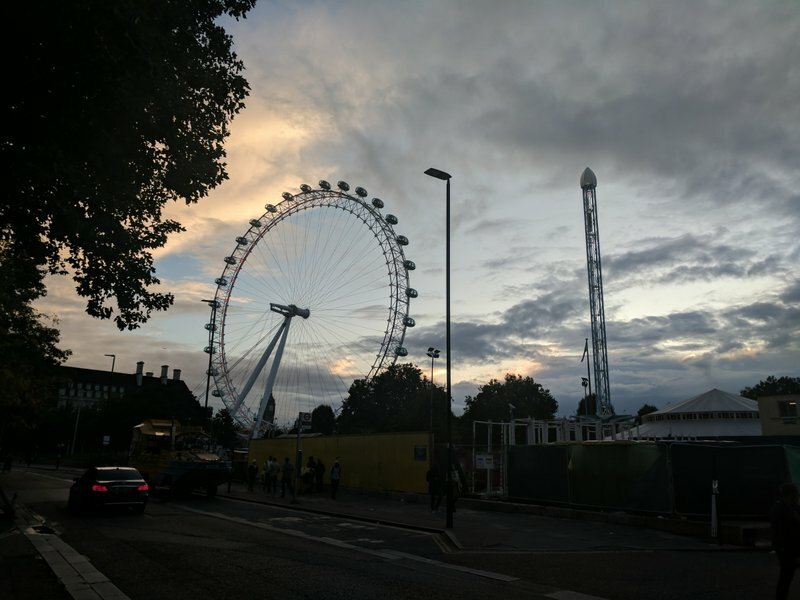 This one looked about half as tall as the Eye and part of something called the London Wonderground. 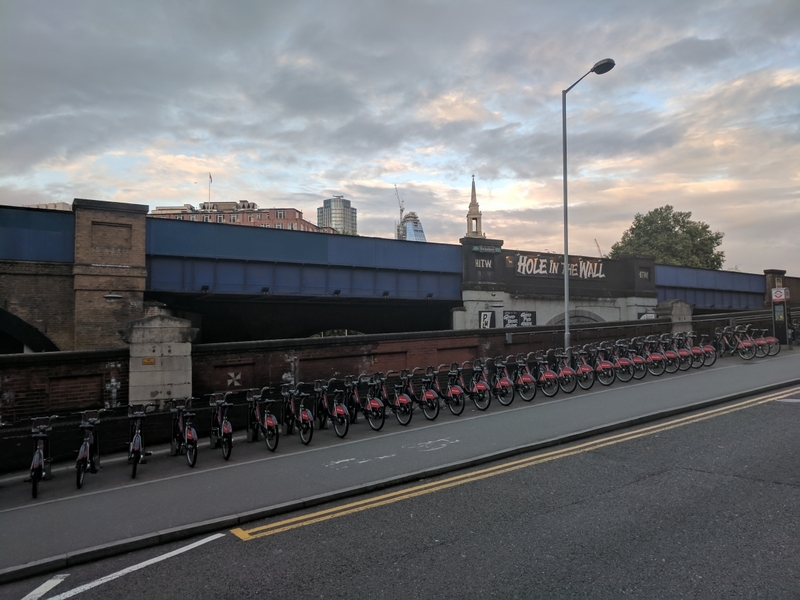 If I wasn't in a hurry to make my train I would have considered riding it since the views would probably have been decent enough with a much more thrilling and cheaper ride. Two massive rides and Not-so-Big Ben. I was coming from Thorpe, but arrived a half hour later than anticipated due to Derrin Brown's queue and an idiot jumping in onto the track. So instead of casually walking to Euston, I left the station in search of food. The winner for convenience was a 3 pound baguette from a street vendor. And with that I was reminded that the French hate us Americans. While everyone from the UK was extremely friendly and helpful to a lost overseas stranger, the teenagers decided to taunt me in French with every bite. I ran across this bridge eating my baguette praying Voldemort wouldn't decimate the bridge like in Harry Potter. I made my train with 5 minutes to spare and started this report that will span England, Barcelona, Stockholm, and Germany! 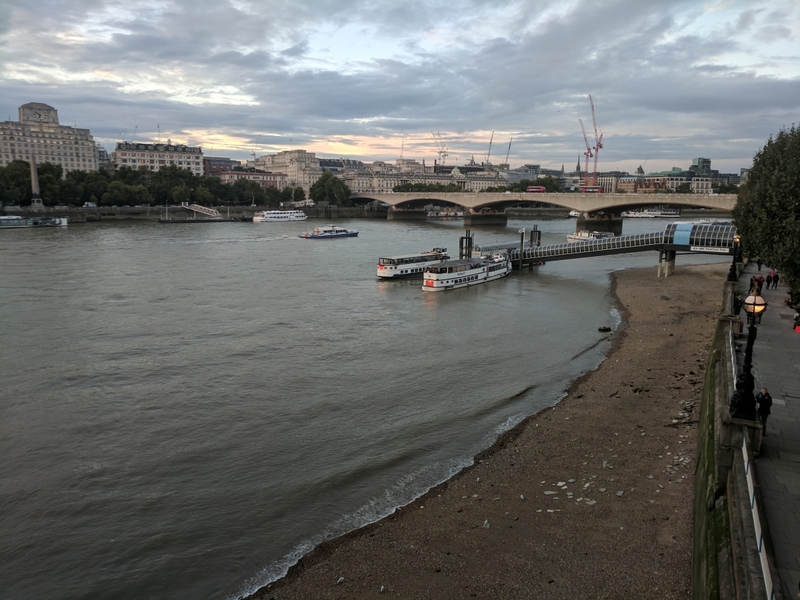 After leaving Alton Towers, I found myself in London for an evening so I spent some more time around the touristy sites. I also learned the Tube is the best public transit system I have seen. I missed a train and immediately figured I would have to wait at least 7-15 minutes for the next one like Boston, New York, San Francisco. Nope! The next train came in 2 minutes. And that was the same on multiple lines too. One other thing I love about London is how seamlessly they blend older style buildings with modern ones. 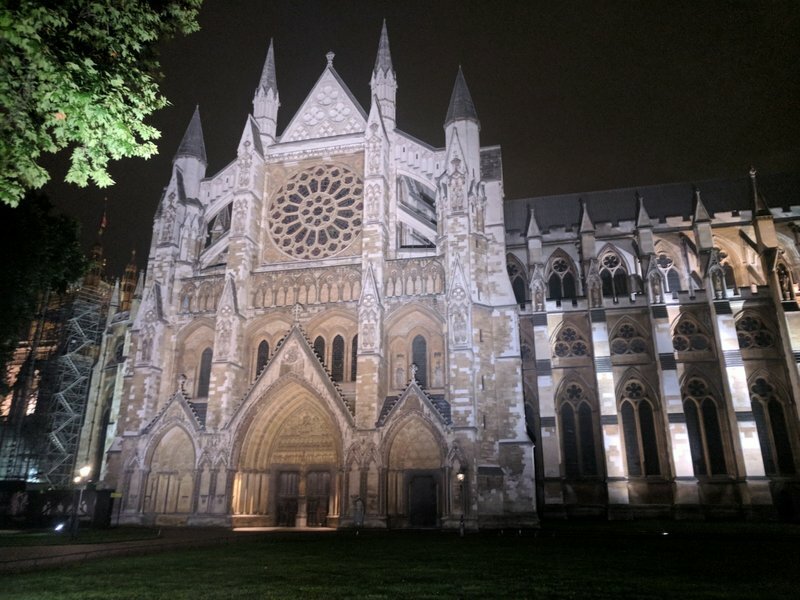 The architecture there is truly remarkable. This is the ultimate tourist shot. 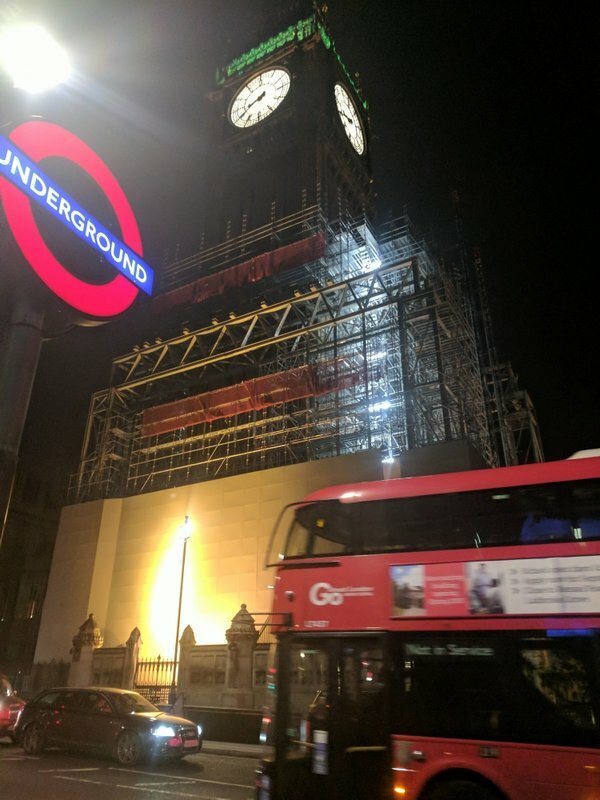 Big Ben? Check. Tube? Check. Double decker bus? Check. Looking like an idiot waiting for a bus? Check. 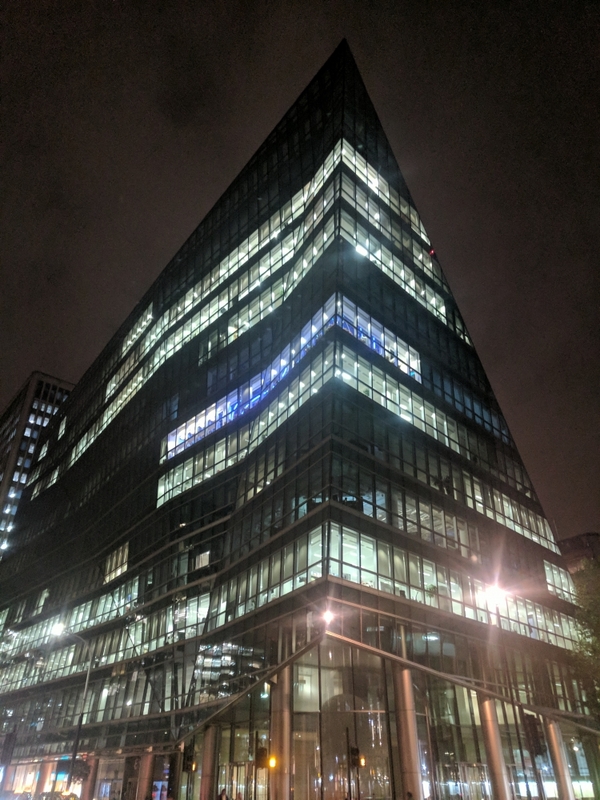 The Eye looked even better at night. Too bad it closed before sunset though. Big Ben is getting some work done. Last edited by Canobie Coaster on Wed Dec 13, 2017 5:38 pm. Last Saturday I landed in London. My plan was to get off the plane, pass through immigration, and get to Thorpe Park by opening using the city buses. Unfortunately I hit a snag on item 2, as the immigration line took almost 1.5 hours. I was faced with a dilemma, wait for the next bus and get there after opening or Uber. I went with the latter but it was a challenge. Not because of car availability. Rather it was because Heathrow is a black hole for cell service. Once I left the airport, I immediately had better service. I had considered renting a car prior to the trip. 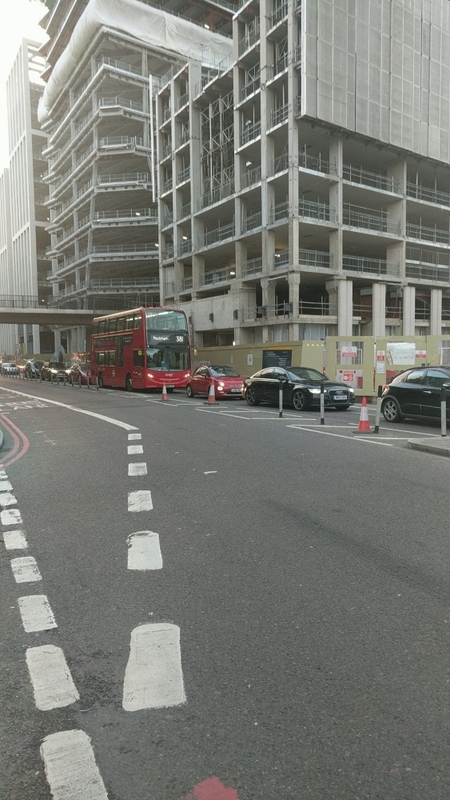 I decided against it because of the lack of availability of automatic cars, but my decision was reaffirmed when I saw cars driving on the opposite side of the road. I knew the UK drove on the left side of thr road, but it still looked wrong to me. I know I would have gone counterclokcwise through a rotary, made a right on red, or done one of the many other driving actions that are muscle memory for me at this point. 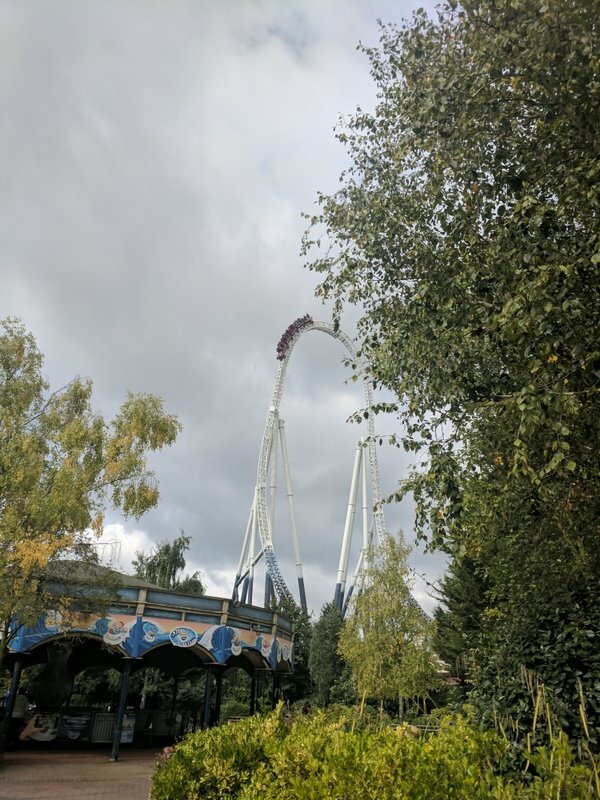 In about 20 minutes I was at Thorpe. 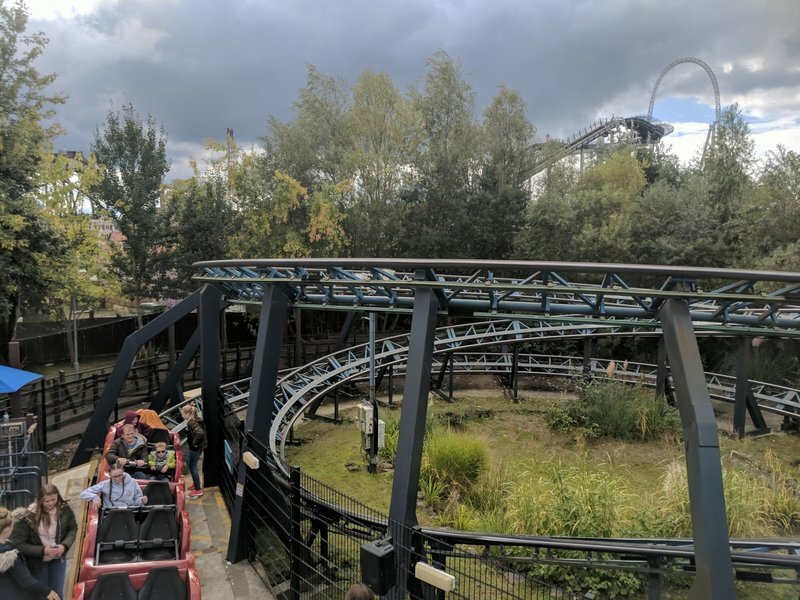 I hadn't heard a lot of good things about Merlin leading up to my visit, primarily because of the situation with Heide Park’s Colossos. I figured I would be in for a Six Flags day. With those expectations, I was blown away. 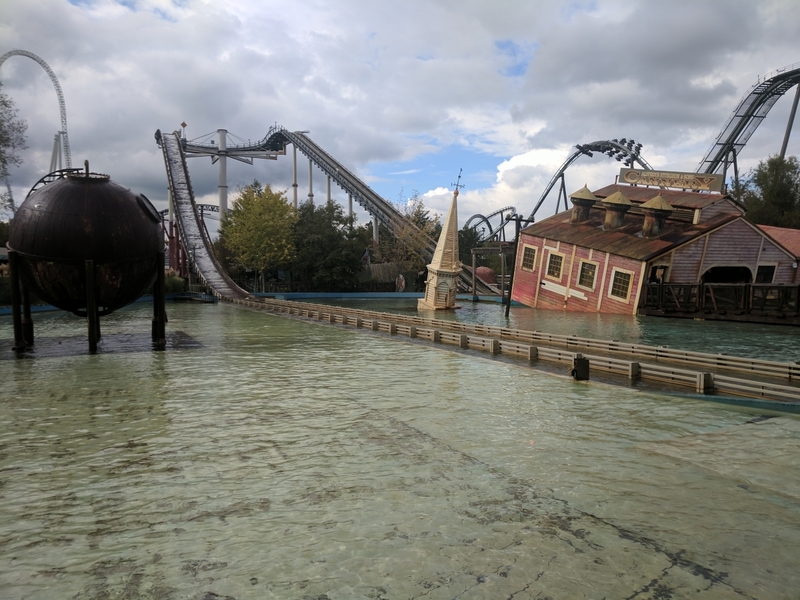 Thorpe Park was really nice! I felt bad for the security guard who checked my bag. Since I had just come from the airport for a 2 week trip, I had everything on me. On one hand, I packed extremely light all things considered as I stuffed everything in a single backpack (being a nerd payed off as I learned how to pack all my books). On the other hand, an overstuffed backpack is way more than any sane human being would bring to a park. My backpack looked like an ACER's belt after an all you can eat buffet, ready to burst. It was 60 degrees with a 50% chance of rain. I figured the park wouldn't be too crowded. I was wrong. The Brits didn't seem to find the weather one bit. Before the park opened, I debated getting a Fast Track but decided against it. I figured hitting the park clockwise at opening could get me on everything before lines formed. I was wrong there as well. The park was definitely more crowded than I anticipated on a cool Saturday. After crossing the bridge, I entered the Hub. For those unfamiliar with Thorpe, I’ll try to describe it as best as I can. 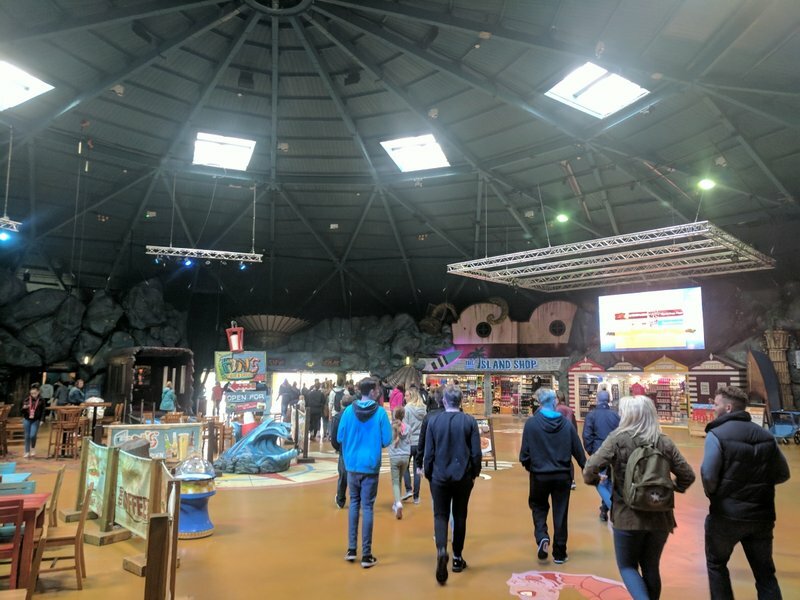 It's basically a giant dome you're funneled through with gift shops, games, food, fluffy, fluffy bunnies filled with medicine and goo, and restrooms. It honestly feels more like a mall than a park in there. After renting a very cheap fluffy, fluffy bunny filled with medicine and goo (2 pounds! ), getting everything in was a puzzle. I had to unload half my clothing to get the darn thing in but I eventually did it. Just ignore the weird American shoveling boxers and socks into the fluffy, fluffy bunny filled with medicine and goo. The hub is a weird entry plaza, gift shop, game area that everyone entering the park is funneled through. I had a plan to hit Colossus first since I heard that one gets a long line early and keeps it all day. I got to the queue 10 minutes after opening and was greeted with a 55 minute wait. Surely that couldn't be right? It wasn’t, but it was still a much longer than expected wait at 40 minutes thanks to one train ops. That didn't bode well for the rest of the day. On the bright side, the queue provided some awesome shots of Colossus. I was planning on trying the front, but I scrapped those plans with the one train ops. That line looked to be 7 trains long. Instead I picked second from the back. Why not the very back? 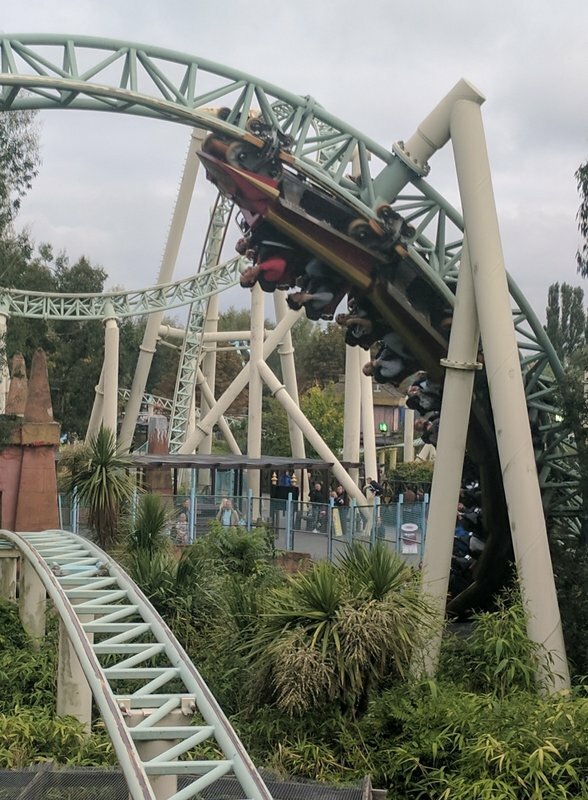 Colossus had early generation Intamin trains and the pitch on the back rows of each car is insanely tight. Most people had to ride spread eagle with the seat back in front of them. No thanks, I would wait until Blackpool to go spread eagle. 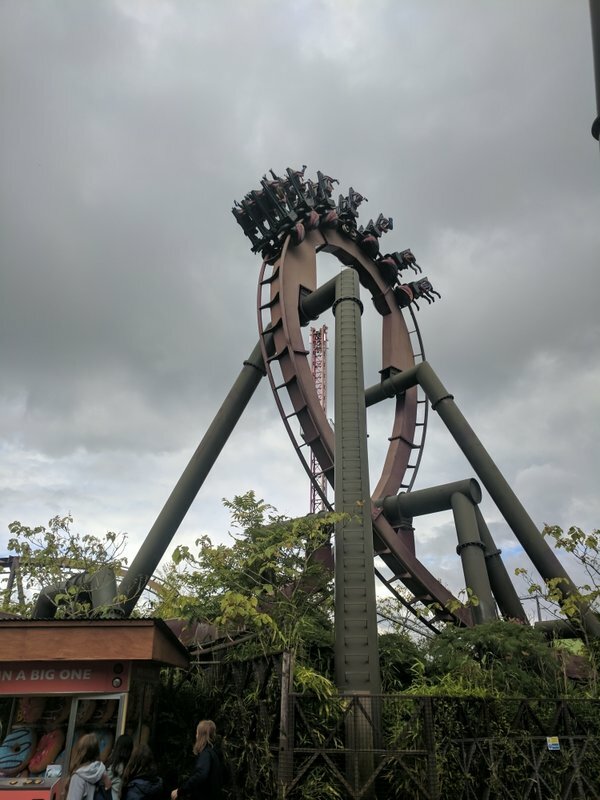 Along with the long lines, I also heard Colossus was pretty rough. While the first bit was spot on, I didn't find the ride rough at all. Sure there were 1-2 moments of light headbanging, but it was no worse than a rougher B&M corkscrew at those points. Oddly enough the worst part of the ride was the first drop. That's a rarity for me, but it just isn't steep at all. Thankfully the rest of the ride is an unrelenting barrage of inversions. The vertical loop was forcefup, the two corkscrews were snappy, and the cobra roll was just ok. So that's 5 inversions. Where are the other 5? The ride ends with 5 barrel rolls. Many may call this repetitive, which I agree with. However if it isn't broke, don't fix it. 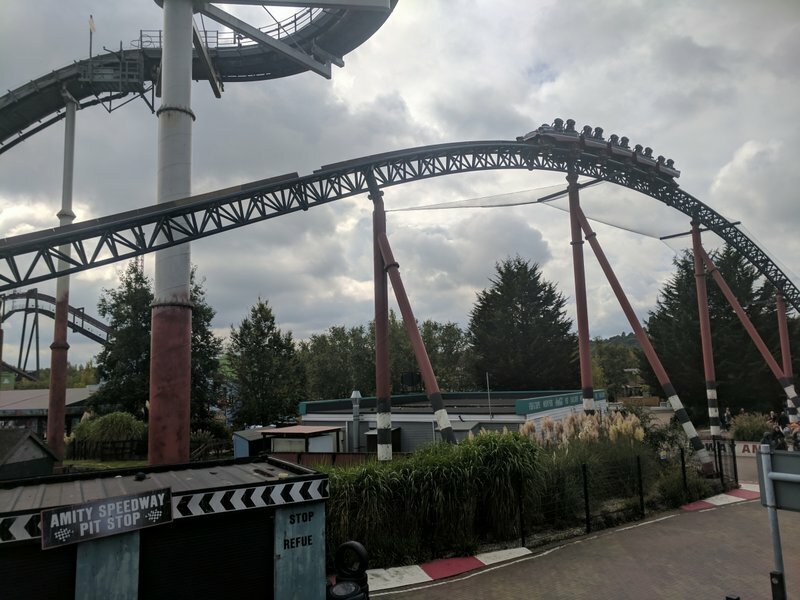 It’s like a hypercoaster having 4-5 airtime hills at the end. Is it repetitive? You bet. But do you really want anything else there? That's how I feel on the barrel rolls. They gave solid hangtime and were pretty disorienting due to the sheer number of them. Here's Colossus even though it's dwarfed by pretty much every other coaster in the park. I expected the worst but it was mostly smooth. I love how close the ride gets to the queue and pathways. Colossus gets a bit repetitive at the end...but that's fine with me since the inline twists were the best part of the ride. 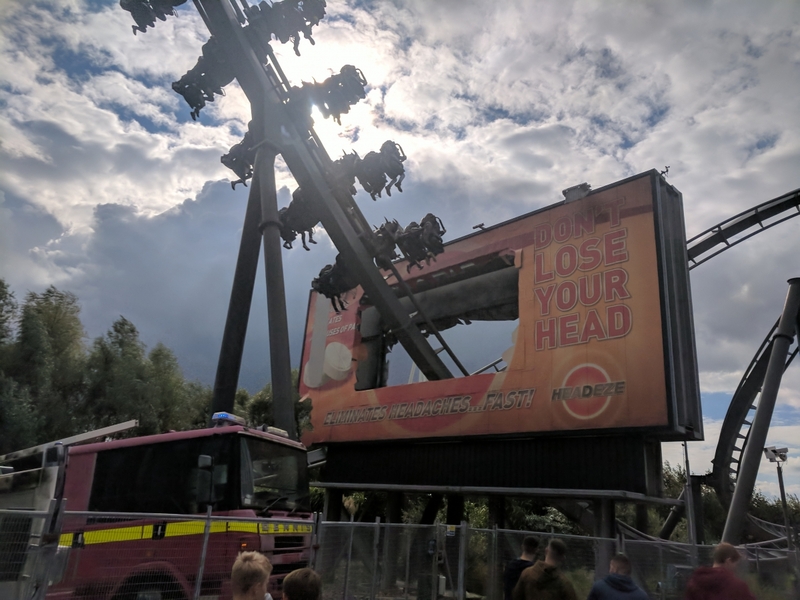 I had seen in the app that Saw was down, but saw that it was testing as I queued for Colossus. Once I got off Colossus, I went over to Saw since I wanted to knock that one off early due to the 8 passenger cars. And luckily it was open...with an 11 minute wait. Yes 11 minutes. That is definitely the most random queue time I had ever seen, but it was really only a 1-2 train wait. 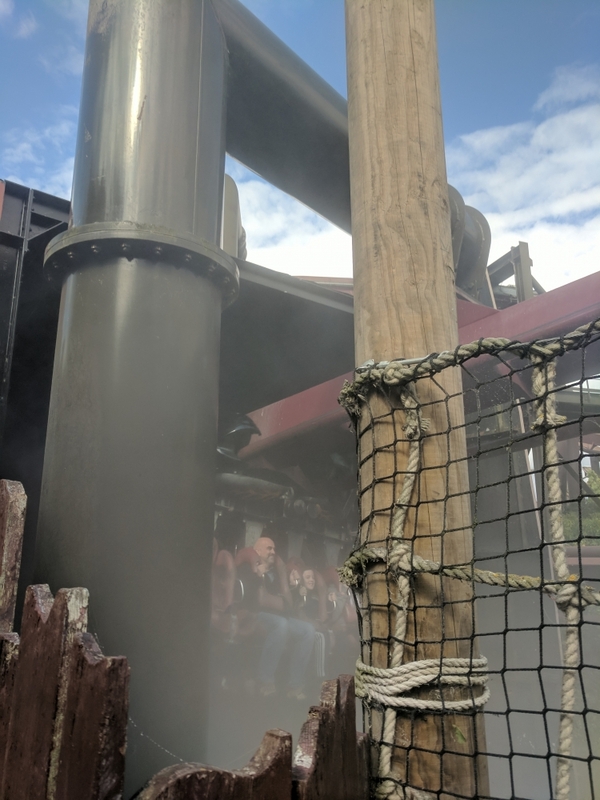 The ride reminded me a ton of Mystery Mine, only smoother and with a longer outdoor portion. The indoor section was very well done. There's some decent torture/Saw related theming and the whole feeling of dread is captured well. The indoor drop is very steep with powerful air and the barrel roll is smooth with a good chunk of hang-time. The second half is where the ride really shined. It began pretty typically for a Eurofighter with a beyond vertical drop. However this one was taller than most and didn't seem to slow down cresting the top. This resulted in air more powerful than usual, and the regular Eurofighters already have some powerful ejector air. The following Immelmann was surprisingly smooth and enjoyable. 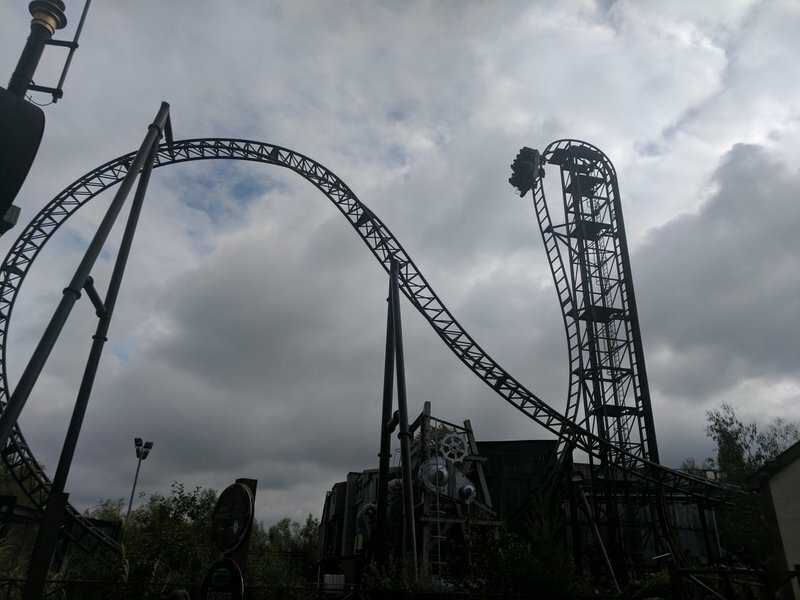 I hadn't heard much about Saw so I had a bad feeling it would be somewhat rough and jerky, but outside of a bump at the bottom of the big drop, it was nice and smooth. I figured the ride was pretty much over at that point (Mystery Mine would), but nope, there was a MCBR. Much to my amazement, the brakes were barely on, so the plunge off the brakes provided air on par with the beyond vertical drop. The final inversions are disorienting and smooth like the first ones. There wws also a nice little airtime hill hidden in there that launched everyone from their seats. Saw is the best Eurofighter I've been on. It's like Mystery Mine, but with a longer outdoor section and smoother. I seriously had no idea the layout was as long as it was. A good chunk of it was hidden behind the station. 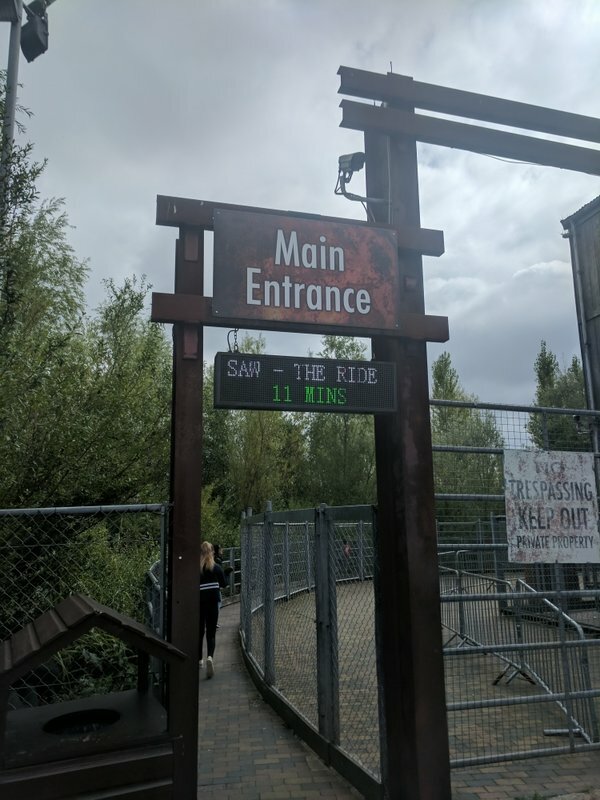 Anyone know why Saw's queue times were oddly specific? 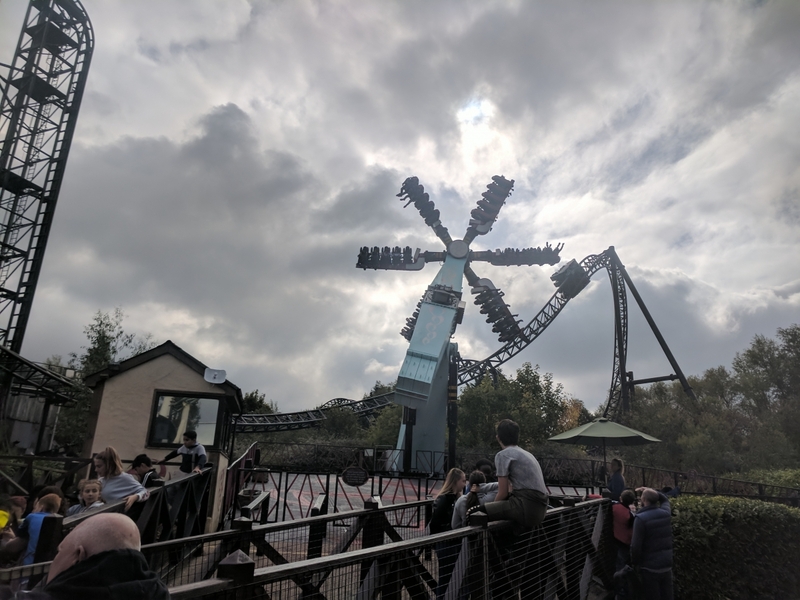 With possible rain in the afternoon's forecast, I went to Stealth next. It also seemed like a good idea in case it snapped a cable or had some other breakdown Inramins seem prone to. It was only a 10 minute wait, so I decided to wait for the front, which appeared to be a 5 train wait (so 15ish extra minutes). I ended up waiting almost an hour. 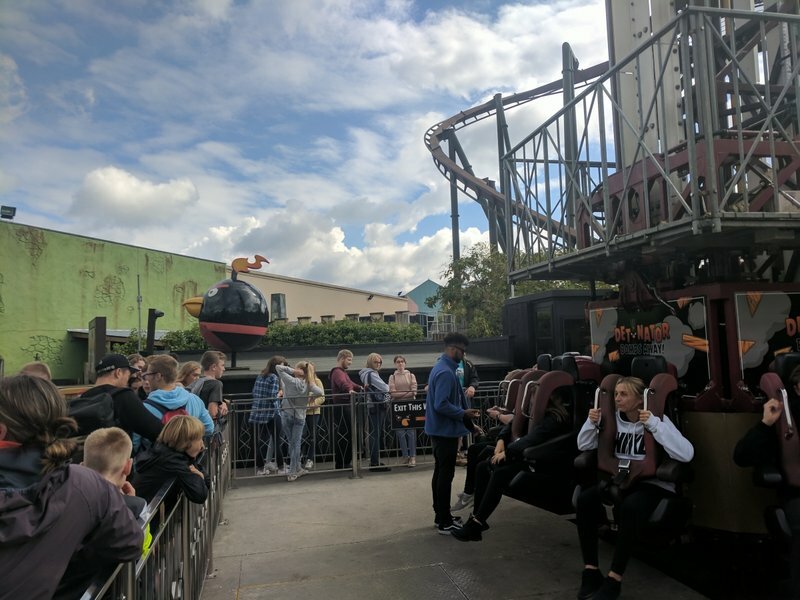 There were 4-5 groups from disabled access that chose the front seat and then Stealth remembered it was an Intamin and closed for 15-20 minutes. I didn't want to bail out since I was a train away from riding and the queue was posted at 60 minutes at this point. Xcelerator was the prototype and launched from the station. The latter accelerators I’ve been on like Top Thrill Dragster, Kingda Ka, and Storm Runner all launch outside the station presumably for capacity. However, Stealth launched directly from the station. There was a separate load-unload platform to help speed up dispatches thankfully. Stealth is like a baby Kingda Ka. Except the final hill actually gives airtime. Oh and I'm sure you can guess why that train is empty. 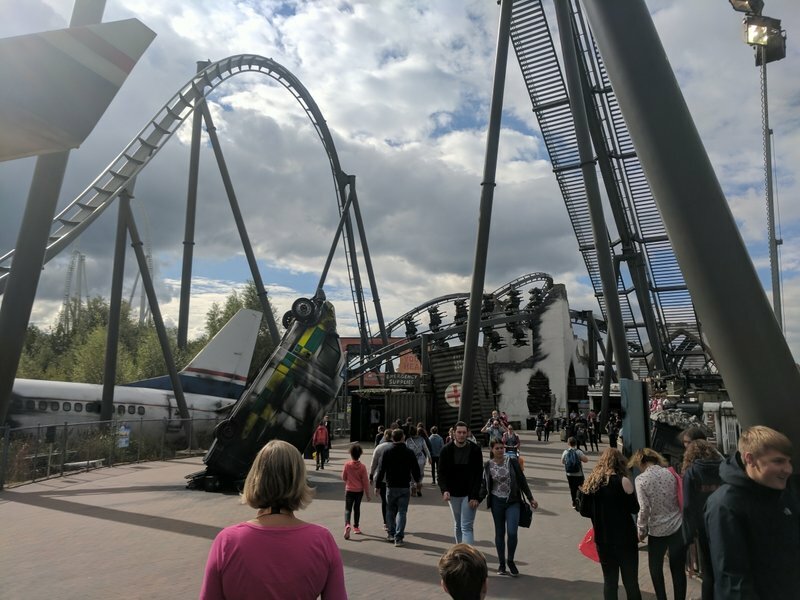 It is an Intamin after all. 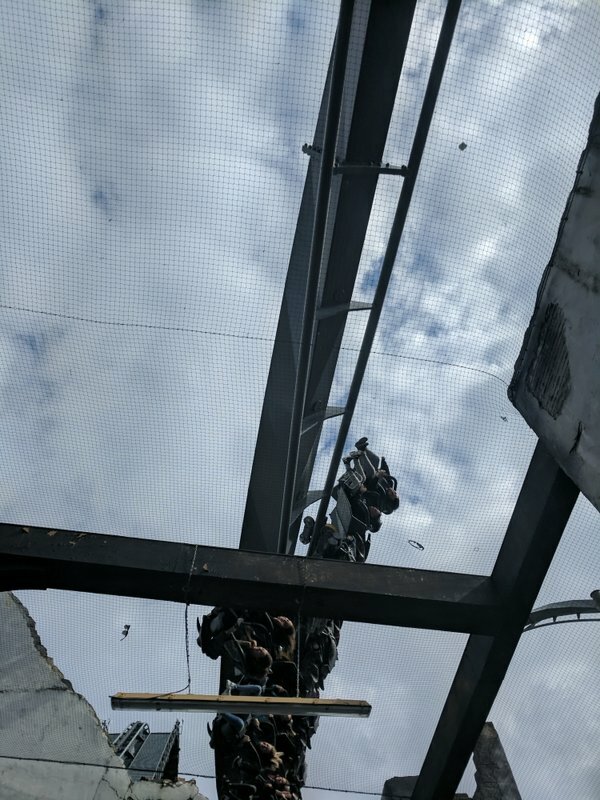 After being shot up, I decided to be dropped down on their drop tower. Themed to Angry Birds, Detonator is a rare Fabbri model I believe. The tower looks pretty small and I’d guess it's only around 120-130 feet. But as the Larson towers taught us, size doesn't necessarily matter. I was shocked the ride only seated 12 riders since most of the towers with circular carriages seat more than that. It wasn't a major problem though as it was my shortest wait of the day at 15 minutes. I feel like this shot makes Detonator look taller than it really is. Fun ride though! I think they missed an opportunity theming their S&S Sky Swatter to Angry Birds. Instead it's blocked off. Is this the last one out there? Up next was Nemesis Inferno, aka the invert everyone would like so much more if they had no knowledge of Alton’s Nemesis. The ride had a posted 70 minute wait, so I decided to wait it out. 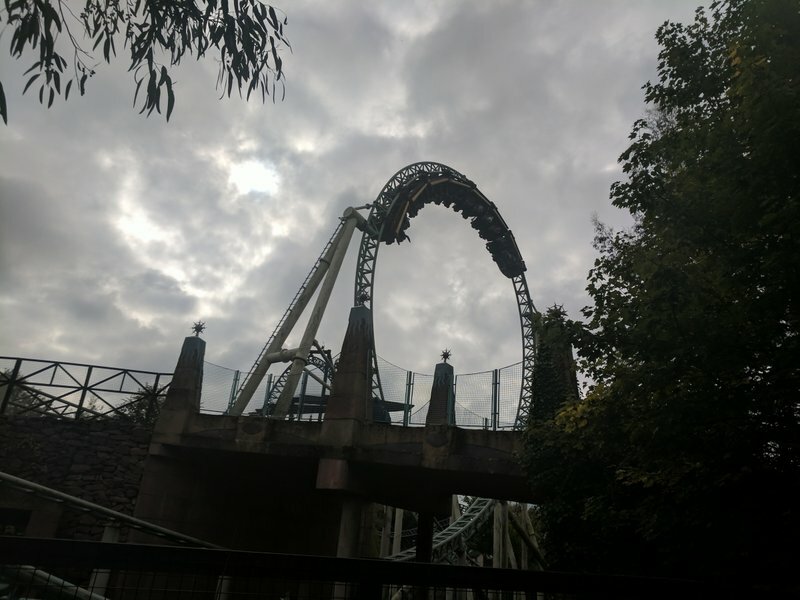 The queue line, like Colossus’s, provided some excellent photo opportunities for the coaster. 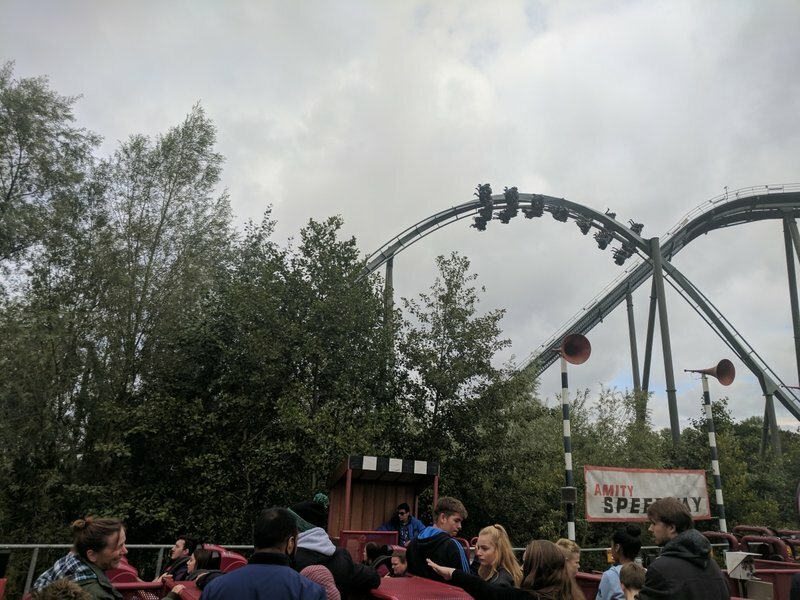 I love how most of the park's major coasters interact with the queues. I ended up waiting closer to 50 minutes, and that was with an extra 10 minutes going towards a ride in front. The pre-lift segment through the misty tunnel is pretty weird. It's fun, don't get me wrong, but it feels out-of-place on an invert. The rest of the ride is well landscaped, but barren with regards to theming. 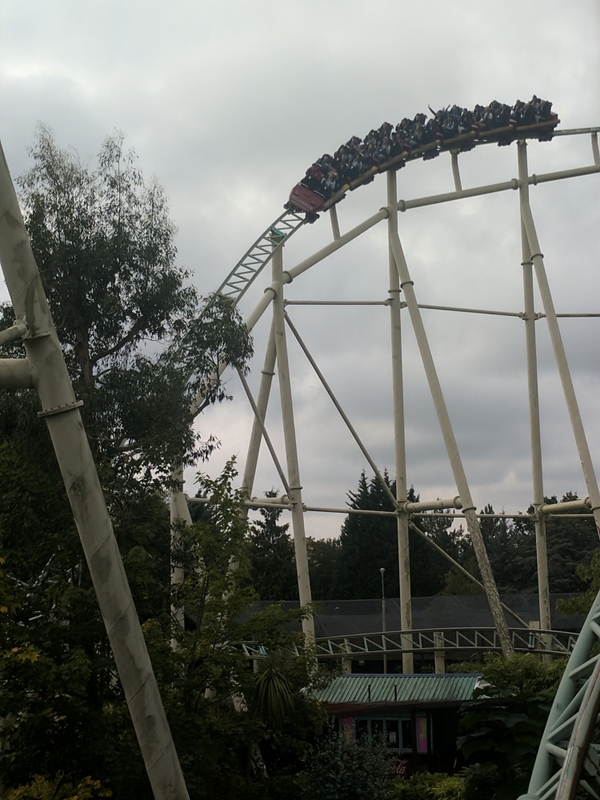 The first drop was a pretty gradual incline which screamed Silver Bullet, a comparison no invert wants. Thankfully the rest of the ride was superior. It doesn't have the intensity of the older inverts, but I still found the loop pretty forceful. The zero-G roll was fantastic as always. 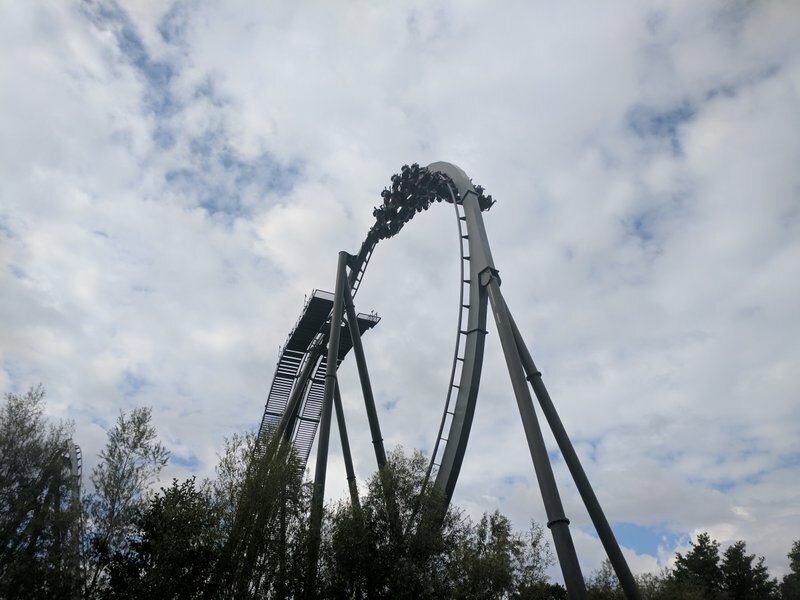 This invert also borrows B&M’s interlocking corkscrews from their floorless coasters, which is a nice off-ride visual. Ride-wise they were decently snappy. The final helix is relatively light on Gs but it serves its purpose to get you back to the station. The drop was reminiscent of Silver Bullet, which isn't a comparison an invert should want. But the rest of the ride is quite good. The zero-G roll was great as always. This was my favorite ride in the park to photograph. Poor Nemesis Inferno. The ride's older brother at Alton gets a series of trenches while Thorpe's gets just a tunnel below the station. I had 3 hours until closing (another reason I didn't want Fast Track, the short operating day) and still 3 coasters to hit. Next I decided to ride X. No I didn't magically fly to Magic Mountain. This is X, aka the techno laser dance party in a box. I waited about 25 minutes for this one, with the last 5 minutes spent waiting for a partner. The park enforces a no single rider policy on X which confuses me. The lapbar has a bar down the middle so you can't slide around in your seat. 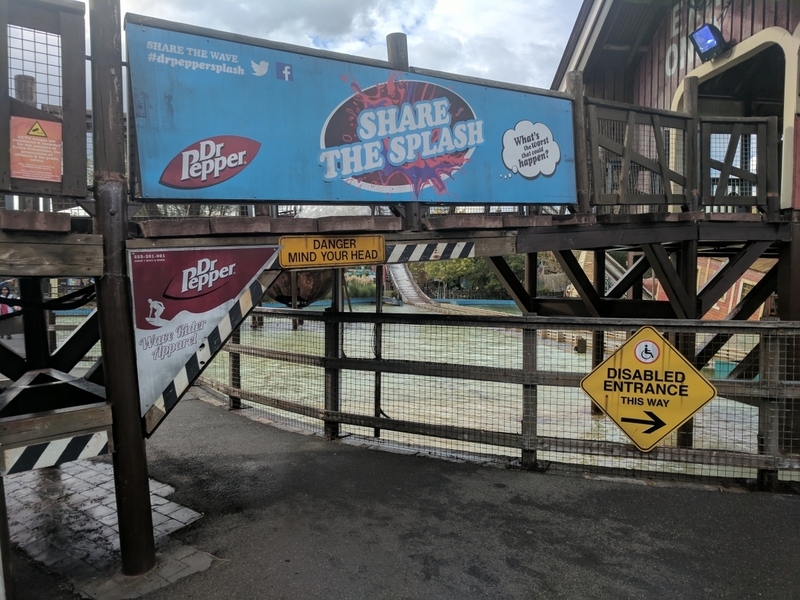 Does anyone know why this ride has a single rider policy? This reminded me so much of Skull Mountain...if you remove the OMFG first drop and heavy metal music. 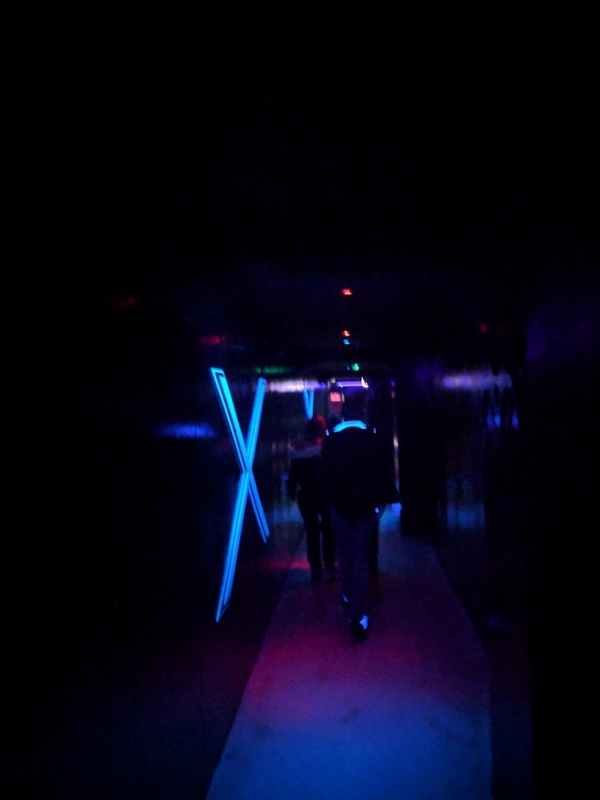 The ride felt like a rave. All that was missing were shots and a DJ. This was actually a respectable kiddie credit. 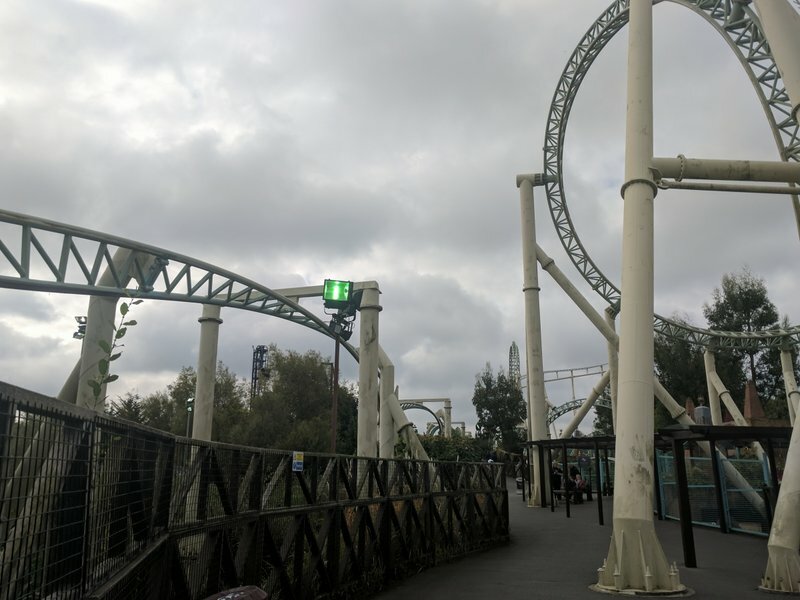 Powered coasters feel weird to me. They accelerate in places they shouldn't and don't in places they should. Swarm was next. 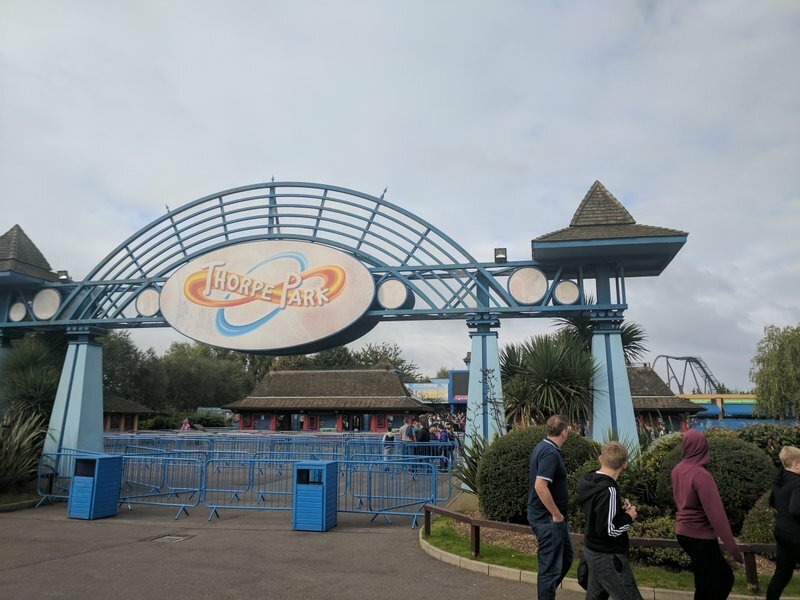 I read a tip to save Swarm until the late afternoon as its placement near the gate causes it to build a significant wait early but then it dies down. I saw the peak wait time at 80 minutes, so when I arrived and saw a 45 minute wait that was much more palatable. Even better was the fact that was a gross overestimate and I only waited 15 minutes, and that was queuing for the front too! Swarm had looser vest restraints than some of the older wing coasters in the US which is a major plus. For those of you that have been on Wild Eagle, you know just how hard those restraints can dig into your collarbone. It feels like you're getting a crappy acupuncture job. No such problem on Swarm. The ride began with an amazing wingover drop. 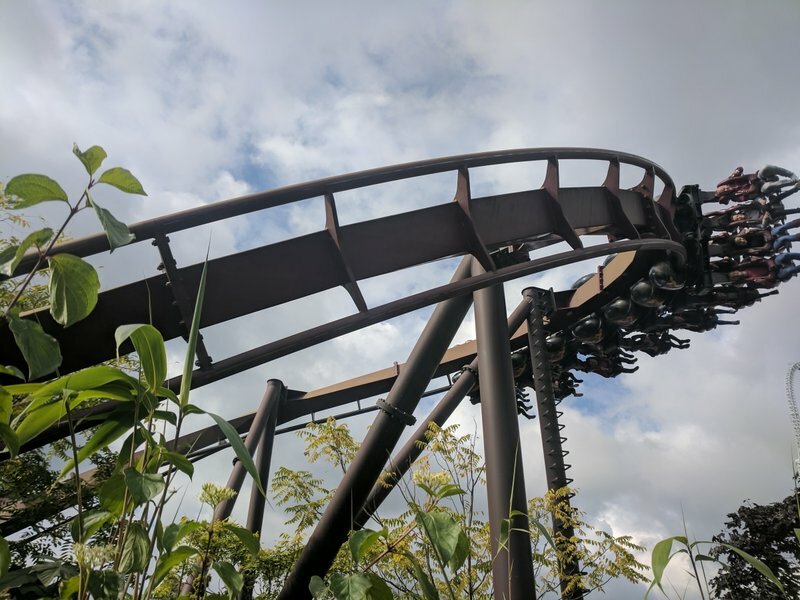 This is an element every wing coaster needs as this and a “keyhole” are the genre’s two signature elements in my opinion. The following zero-G roll had plenty of floater air and it was followed by a great pass through a billboard. Think Backlot Stunt Coaster except actually traveling faster than 20 mph. The inclined loop was just ok in my opinion but the corkscrew was very good. It wasn't forceful but it was graceful and drawn out. The final inversion redefines the station flyby for me. GCI’s straight sections are child’s play now. Swarm flies over the station via an inline twist with even more hang-time than the zero-G roll. 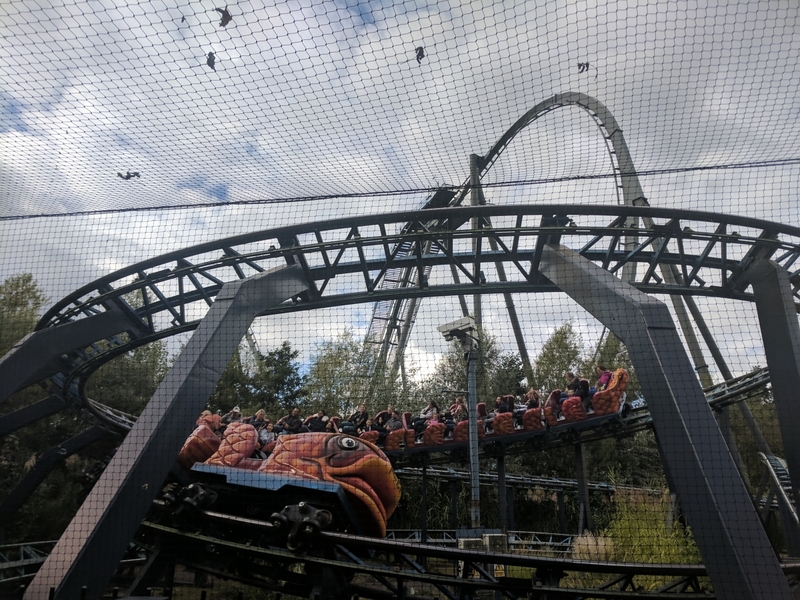 Swarm was a very good wing coaster. I love how the major coasters all had little areas themed to them. 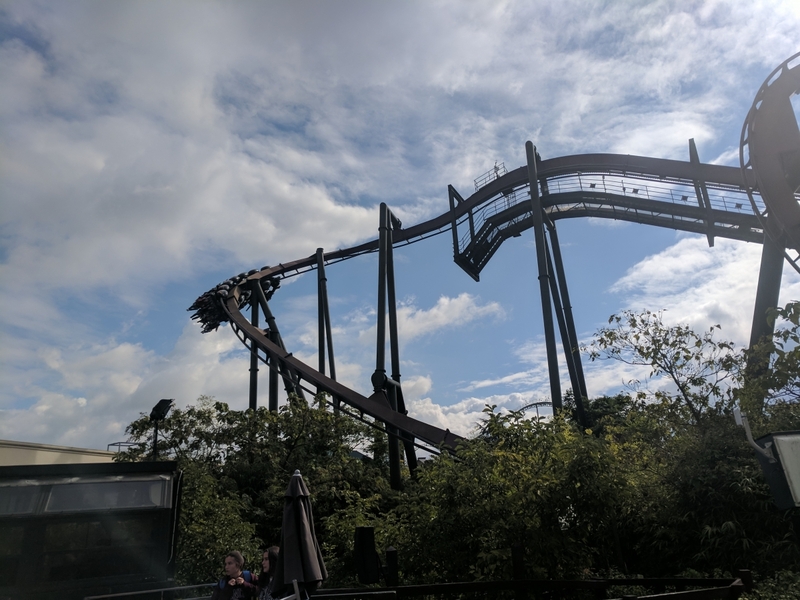 As great as Wild Eagle's drop is, wing coasters need the wing over drop. They should put this sign by B&M inverts. This redefines the station fly by and poops all over the straight sections on GCIs. 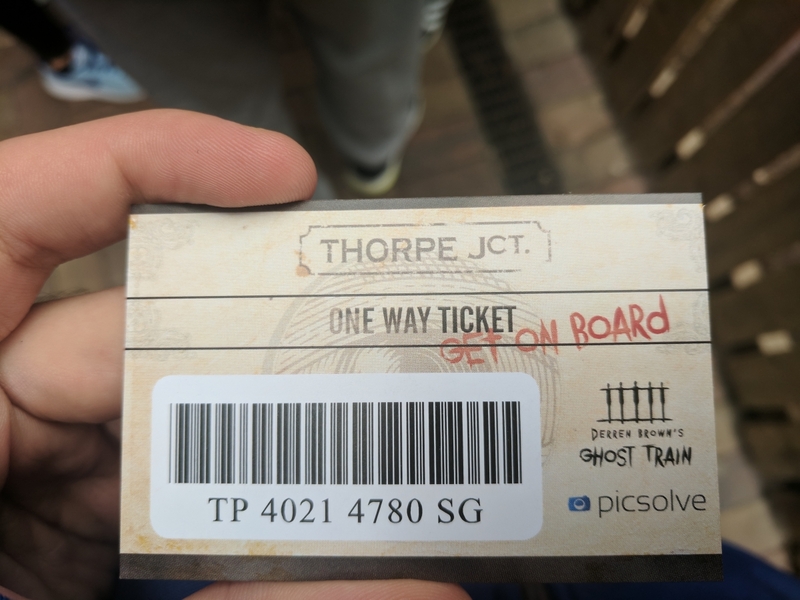 Originally I was planning on skipping Derren Brown's Ghost Train for a few reasons. 1) I’m generally not a big fan of VR on rides. 2) The queue. The line approached 90 minutes for most of the day and the only way to Fast Track it was the unlimited option at ~$130. However, I had an hour before closing and 1.5 hours before my bus (the time I really cared about). By this point, I had come to realize many of the park's wait times were inflated. Also my disdain for VR is because I have only experienced it on coasters not originally designed for VR. In the case of DBGT, the VR was designed around the ride so I was optimistic it would be better. The wait was posted at 55 minutes and I probably waited just south of that, but it was fairly accurate. A big thing about this ride is to not spoil anything. That is reiterated many times during the attraction. 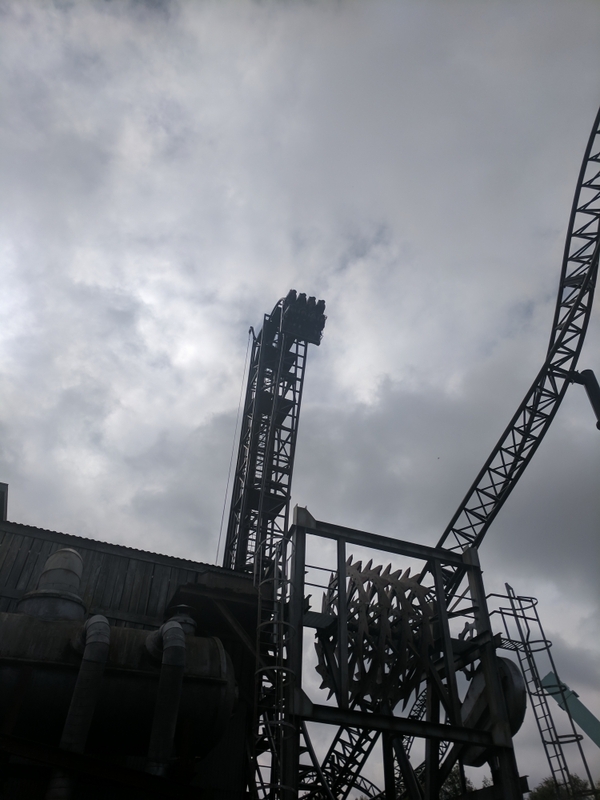 Going in, all I knew was that the ride took place on a train, had VR, and was prone to more downtime than Lightning Rod last year (thankfully that appears corrected). What I can say about the ride is this- do not spoil it for yourself. I had no clue what was going to happen throughout and that was probably the scariest thing about it. 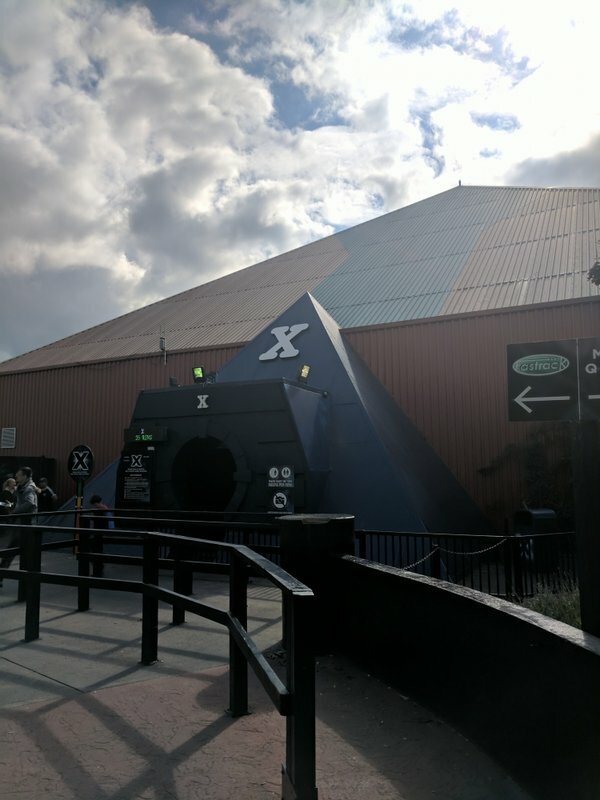 The VR wasn't what I expected, but what they do choose to show is pretty darn convincing and how they show it adds a ton of suspense into the ride. One other thing I want to add is that the VR headsets have audio with them, which adds another element to the attraction compared to the audio-free VR offered by Six Flags. I was blown away by the Ghost Train. 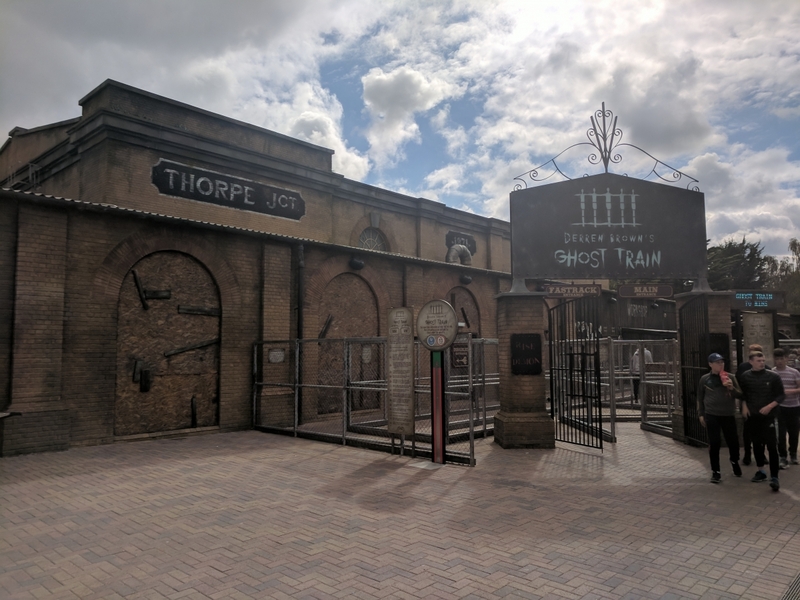 I usually am not a fan of VR-centric rides, but Thorpe knocked it out of the park. A one way ticket to the park's most thrilling attraction. I didn't ride them since I had a 2.5 hour train ride after the park closed, but the park appeared to have all their water rides open. Tidal Wave, the colossal shoot the chutes, has an entire area themed to it, something that I thought I'd only ever see at Canobie. Depth Charge looked like an interesting slide but not worth a 30 minute wait. 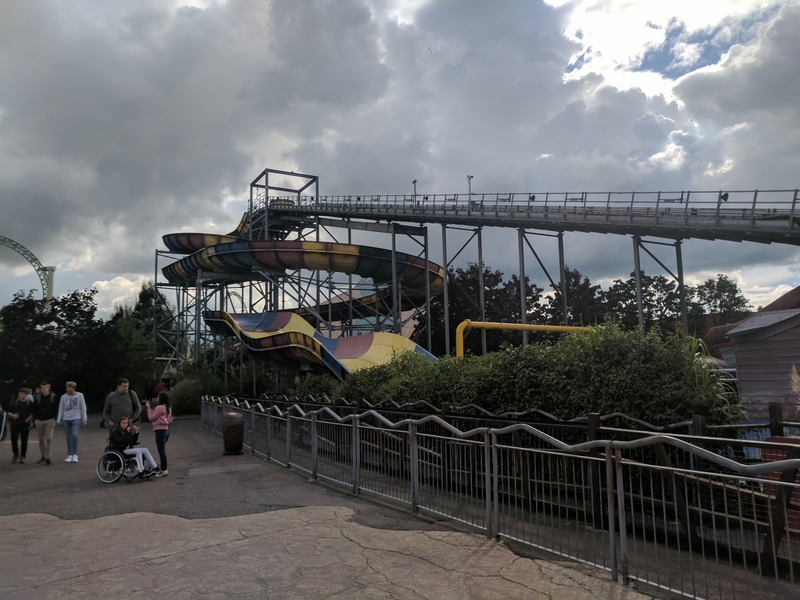 I also skipped Storm Surge and its 45 minute wait since I rode the version at SFNE several times until it was removed, a removal I had no qualms about. For some odd reason this had no wait on a 58 degree day. Note the sarcasm. For some odd reason, this one had a 45 minute wait on a 58 degree day. I'm serious on this one. 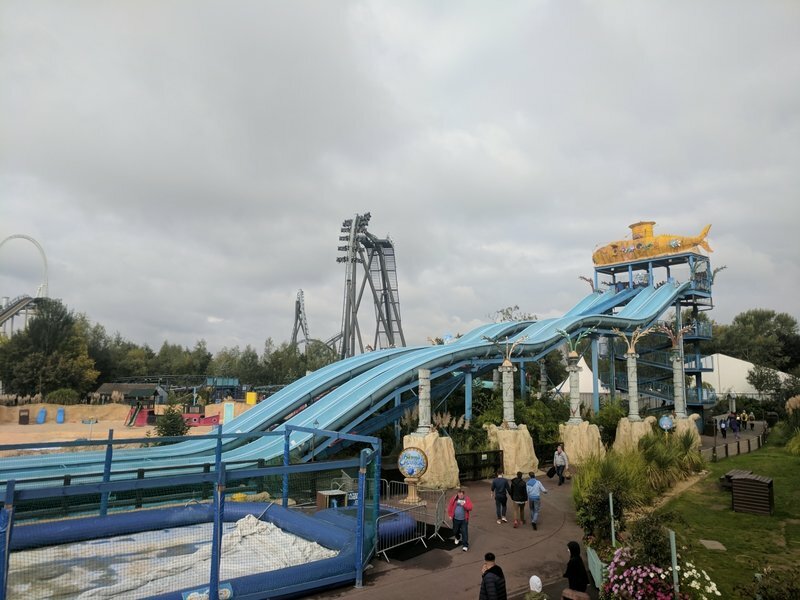 I had also heard Thorpe felt similar to a US park. Sure there was the ever familiar KFC and corporate sponsorships, but there were also some never in America things such as DodgeArm. You would pay (though really I think the spectators should have to pay ) to try and dodge 2 sweeping arms. Let's just say I saw a few kids get clobbered. Am I going to hell for laughing? KFC reminded me of home. You probably wouldn't see a path like this in the US. You definitely wouldn't see this in the US. You paid to basically dodge these large sweeping arms. A bunch of kids kept getting clobbered by them. Was it bad that I laughed? 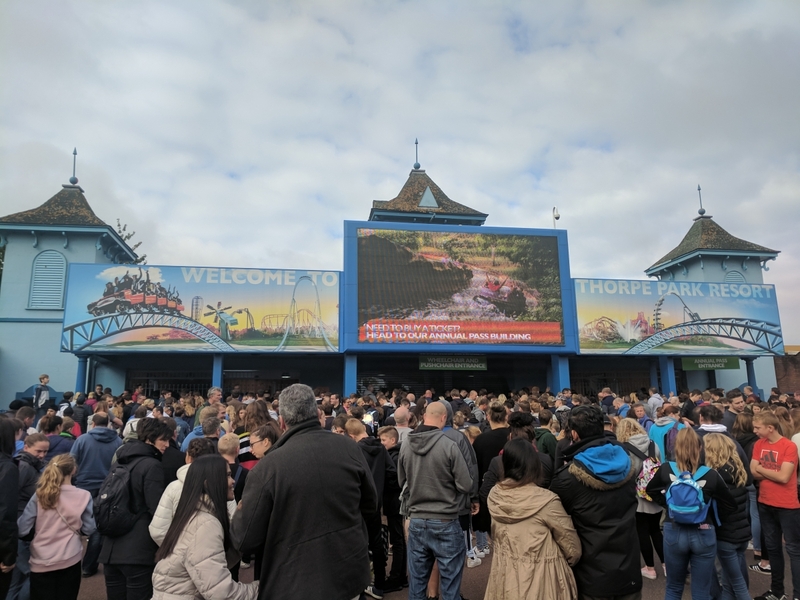 Overall I had a wonderful time at Thorpe Park. Sure lines were longer than expected but outside of the one train ops on Colossus, I thought operations were very good. None of the coasters are world class in my opinion, but they have 5 very good ones. If they ever rounded their park out with a hyper or a RMC, I think their collection would be perfect. Along with the coaster collection, I was really impressed with the park’s theming. No the theming wasn't Disney, but it was about on par with a Dollywood. 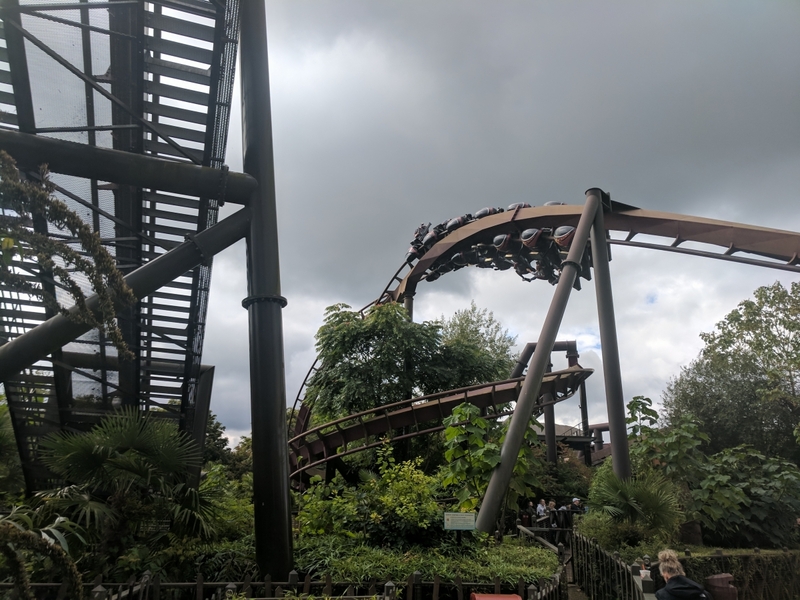 The combination of theming and rides made Thorpe a great park in my opinion. Up next is Blackpool! Though that may be a while due to the cell/wifi service being awful for upload speeds. Oh, didn't realize you were starting a brand new thread for your European reports! Completely missed this until just now. Good stuff -- as always, I enjoy your photos and writing. I have actually seen one of those DodgeArm things over here, not at a park but as part of the Great Allentown Fair last year. 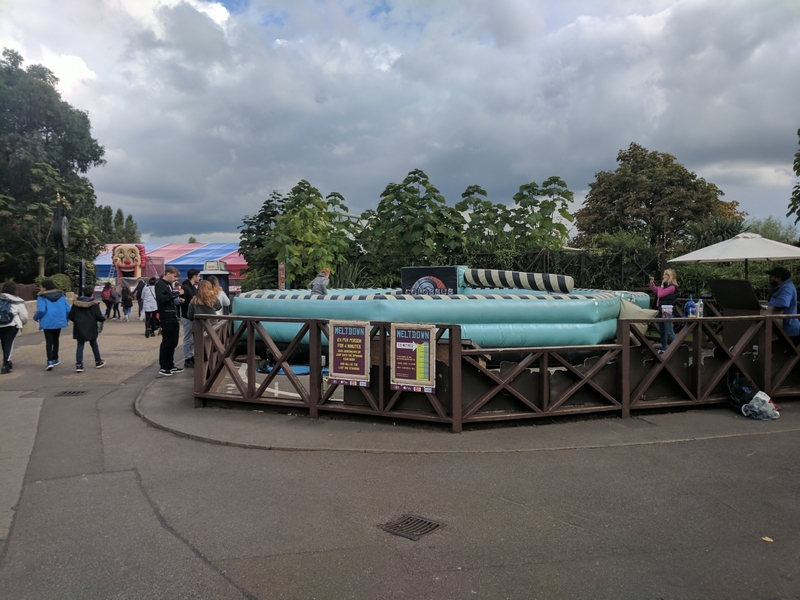 I want to see a park take it a step further and do Wipeout: The "Ride", complete with mud pits and the big balls (and I'm sure a lengthy waiver, as well). Thanks! I named them deliberately since I felt they were two distinctly different things. I knew I had this trip coming later this year. That's cool that it made its way to the US. Figures it's at a fair I mean it's no worse than a mechanical bull, right? I'm glad to see the inflatable spinning arm things coming to more parks! They were really fun at IAAPA and like you said, no worse than a mechanical bull! I'm glad you had a good time, the park is fine but gets a lot of Six Flags comparisons due to clientele, one train ops, and wait times. And you made the fatal mistake about the weather...it's important to note that American's are sissies when it comes to the weather compared to pretty much everyone else! They're out in rain, cold, sleet, whatever! Parks stay open longer and run stuff in snow! We don't do that here! I think I went on a good day then since everything other than Colossus seemed to be going at max capacity. When that happens I can't fault a park for generating long lines. Honestly I'm impressed they had that many people with the weather. I'm glad we're at least getting more Holiday in the Park events in the US. Just dress appropriately and any weather short of a twister, category 5 storm, etc is fine for a theme park. 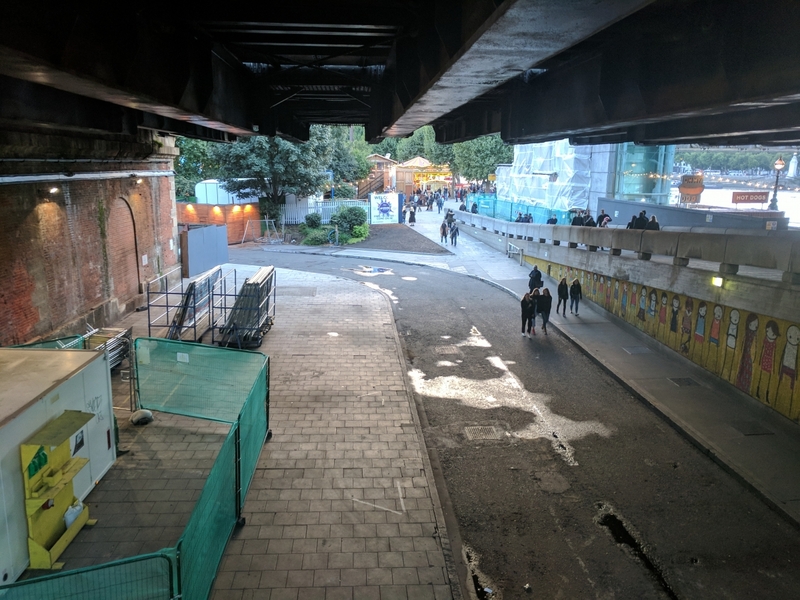 I also found the clientele respectful, but I can see how that would be possible based on some of the people I ran into in London and on the trains. SharkTums wrote: ...And you made the fatal mistake about the weather...it's important to note that American's are sissies when it comes to the weather compared to pretty much everyone else! They're out in rain, cold, sleet, whatever! Parks stay open longer and run stuff in snow! We don't do that here! Great report on Thorpe. Thanks for sharing. 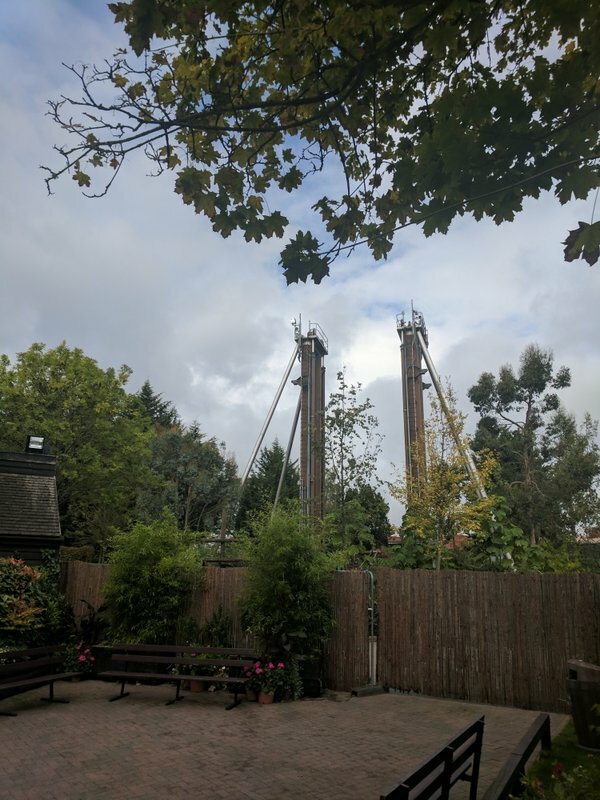 I was curious about your opinions since I've realized Thorpe is the one major UK park I'd skip if I hypothetically needed to. I'm glad you had a good visit. Entertaining report as well! Great report, seems like a fun park. Love your shots of London, always have wanted to go there. Thanks! I really wish people stateside cared less about the weather. 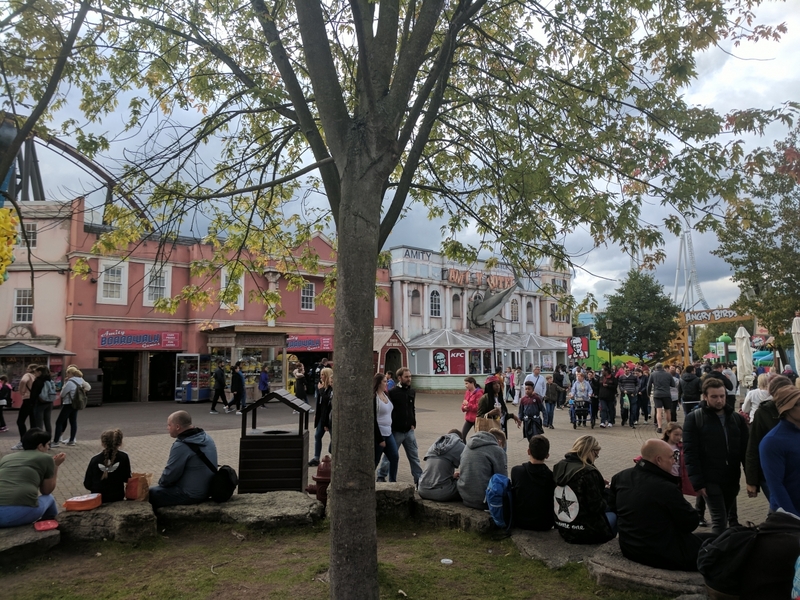 cal1br3tto wrote: I was curious about your opinions since I've realized Thorpe is the one major UK park I'd skip if I hypothetically needed to. I'm glad you had a good visit. Entertaining report as well! Of the big 3 parks, I'd put Thorpe last. It's not a knock against Thorpe, rather it's just how good Alton and Blackpool are. boldikus wrote: Great report, seems like a fun park. 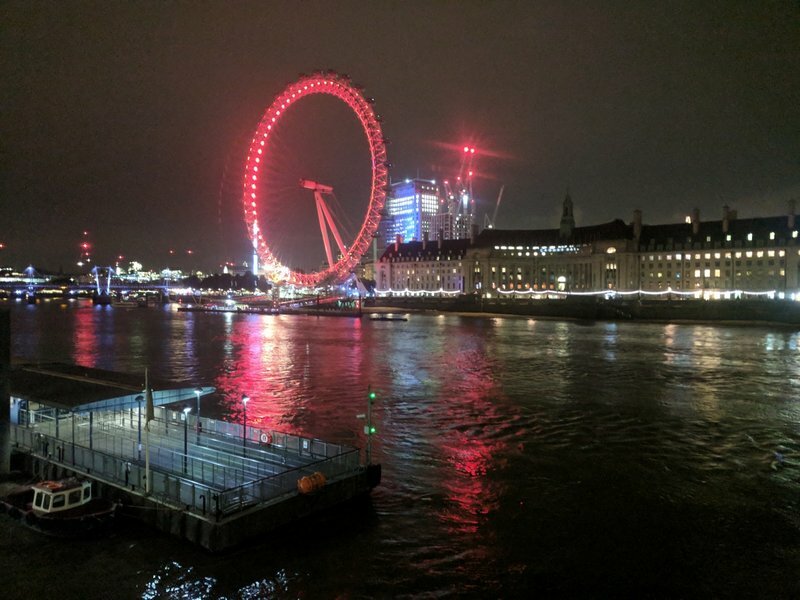 Love your shots of London, always have wanted to go there. As much park visiting I had planned this trip, I wanted to make sure I had time to see London, Barcelona, etc. Both cities were very impressive.